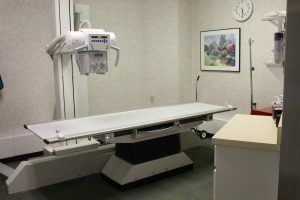 Diagnostic X-Ray – Wayne Radiologists, P.A. Diagnostic x-ray is the most frequently used form of medical imaging. Diagnostic x-rays are used to assess bones and soft tissue. Wayne Radiologists uses Computed Radiography in which x-rays are viewed on a computer instead of traditional film. X-Ray exam can take anywhere from five to thirty minutes to complete depending on the number and type of exam ordered. You may be asked to change into a gown and remove any metal from the area being x-rayed. Depending on the body part being x-rayed you may be positioned sitting, standing or lying down. You will be repositioned throughout the exam to obtain all the required views of the body part being x-rayed. The technologist will check the images before you leave to make sure no additional images are necessary. If you are pregnant or think you may be pregnant you should discuss the risks of having an x-ray with your doctor prior to the exam. Appointments are not necessary for diagnostic x-ray exams, however you will need a written order from your doctor.